Cabbie inquest: Kylie Minogue's guitarist tells how building "fell from the sky"
Kylie Minogue's guitarist has said he and his girlfriend narrowly dodged death on Valentine's Day after a building fell "out of the sky" - crushing the taxi he was in and killing the driver. Luke Fitton had enjoyed a romantic dinner with his girlfriend at Gordon Ramsay's Bread Street Kitchen restaurant and the taxi was driving along High Holborn when masonry struck it. A large chunk of debris landed on his chest just centimetres from his face. Taxi driver Julie Sillitoe was hit by the cement and killed almost instantly in the accident, which happened at around 11pm. "Quite instantly, I felt I had a huge piece of concrete on me, and it just seemed to go from absolute silence and normality to the complete opposite. "I didn't understand what was going on. I was conscious, I was screaming and screaming because the pain was so blinding." He said that he was overwhelmed by dizziness and confusion, and spent what seemed "like an eternity" calling out to his girlfriend to check she was okay. "People were trying to see what was going on and help, and I remember screaming to them to get this piece off me. Some piece of concrete. I'm not sure how much time was actually passing, but it felt like an eternity. Eventually, I got some kind of response from my girlfriend who was speaking to the people in the street. I was screaming, shouting, trying to get whatever was on me off. It just felt like it was not stopping going down, it was crushing, crushing, crushing." According to his website, Mr Fitton joined Minogue's live band as lead guitarist in October 2010 and performed with her on the Kylie Aphrodite Les Folies world tour. Albert Grant, principal building control officer for the borough of Camden said he inspected the building that night and the following day, when he managed to gain access to the roof. He said the five-storey building, occupied by an English language school, looked undamaged, besides the missing triangular lintel. "I arrived at 11.55pm. 'I got out at Holborn Station and quickly identified a lot of commotion. 'It was quite dark, there were no lights on building. You couldn't really get a clear view." The widower of a taxi driver killed on Valentine's Day by falling building debris asked her to stay off work because of high winds - but she refused so she could buy him a birthday present. Mother-of-three Julie Sillitoe, 49, was killed when large pieces of masonry fell from a building in High Holborn, crushing her. Her two passengers narrowly escaped with their lives after the chunks of cement fell just centimetres from their heads, an inquest has heard. Her widower, security consultant Steve Sillitoe, told St Pancras Coroner's Court, how he pleaded with his wife not to go to work because of the bad weather. But she shrugged off his concerns and went out to work as normal at around 8pm. He said: "She came up and said 'I'm going to go to work now'. It was very windy outside, it was bad weather. I said to her 'Do you have to go to work? Why don't you take the night off?' "She said 'I have to go to work, I have to buy your birthday present'." That night she picked up a young couple in her taxi at Gordon Ramsay's restaurant Bread Street Kitchen in the City. But as they drove through High Holborn shortly after 11pm masonry large pieces of cement fell from a building, crushing her Skoda Octavia. Ms Sillitoe, from Finsbury in north London, had to be cut from the wreckage but attempts to resuscitate her failed and she died at the scene. "She was extremely family orientated - with her granddaughter and her sons. Shortly before she learnt that (her son) Ben's partner was pregnant again with a girl, which she was overjoyed at ... It is a number of months since Julie was killed, and every single day I miss her very much." Central London- A40 Holborn Viaduct (EC1A) is blocked in both directions at the jct of Newgate St following collision. Expect delays. 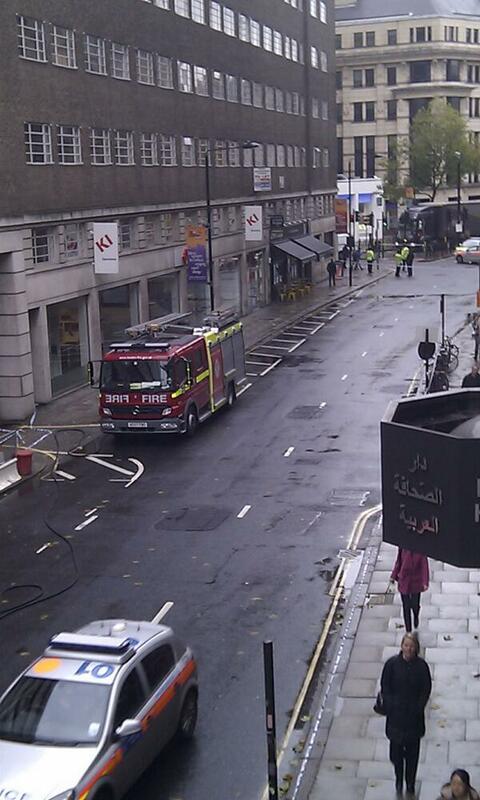 No one was injured in the small explosion at High Holborn which happened during construction work to a building. London Fire Brigade has confirmed to ITV News that smoke is coming from electrical cables beneath the pavement at High Holborn. A40 High Holborn (one-way) remains shut btwn New Oxford St and Drury Lane due to an incident. Tbks to Holborn Circus and to Waterloo Bridge. UPDATE: Routes 1 8 25 98 171 242 serving High Holborn, WC1 remain subject to delay/diversion due to a Police incident. Workers in High Holborn say they are being told to stay in their offices this lunchtime after reports of an electrical explosion. Police have cordoned off high Holborn due to electrical explosion. Trapped in the office again! Police say they are growing increasingly concerned for a 15-year-old girl from Bexley who has not been seen since Friday 4 October. 15-year-old Melissa Attard was last seen shortly before 5pm in the High Holborn area. Melissa is approximately 5' 4" tall and of medium build. She has brown eyes and long dark brown hair. She was last seen wearing a black jacket with fur around the collar, dark leggings and black boots. She is known to visit the Plumsted, Brixton, Croydon, Charlton and Lewisham areas. Anyone with information should call on Melissa's whereabouts is asked to call Bexley Police's Missing Persons Unit on 101.